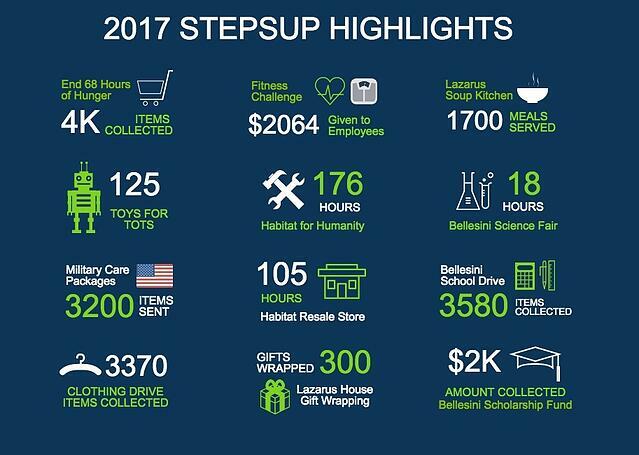 Our WEI StepsUP program is the backbone of our social responsibility and volunteer program, with successful initiatives ranging from food drives to hours spent at a local soup kitchen. Year after year, the program continues to grow, allowing us to help more of our community – and 2017 followed suit. 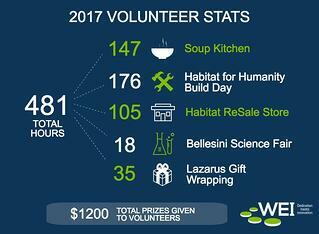 A total of 481 hours were spent volunteering around the community including at the Habitat for Humanity Resale Store, Bellesini Science Fair and Lazarus House Soup Kitchen. Of those total hours, 147 of them were at the Lawrence, MA Lazarus House Soup Kitchen, where we helped serve more than 1,700 meals. WEI StepsUP sent 3,200 items in care packages to military stationed overseas. We collected more than 3,500 supplies during the Bellesini School Drive and $2,000 for the Bellesini Scholarship Fund. WEI StepsUP clothing drive gathered more than 3,200 pieces of clothing for youth and adults including professional attire. WEI StepsUP donated more than 4,000 items to the annual food drive, Salem End 68 Hours of Hunger. WEI’s focus on diversity inclusion and being that helping hand runs throughout the WEI culture. The welcoming interactions employees receive from day are the true invitation employees receive into the WEI Family. The work-life balance, management styles, and ability for every department to work together so well leads to increased employee empowerment and overall satisfaction. All of these dynamics working together within one organization leads to a different approach when it comes to community service. Many organizations force employees to volunteer once or twice throughout the year to ensure that social responsibility goals are reached. At WEI, however, employees are excited to work with other organizations and are quick to use their allotted optional hours of volunteering each month. For 2018, WEI StepsUP has already begun accumulating hours towards community service projects and next month will be participating in the annual Salem End 68 Hours of Hunger, along with other initiatives throughout the year. Learn more about how we give back and what life at WEI is like here.